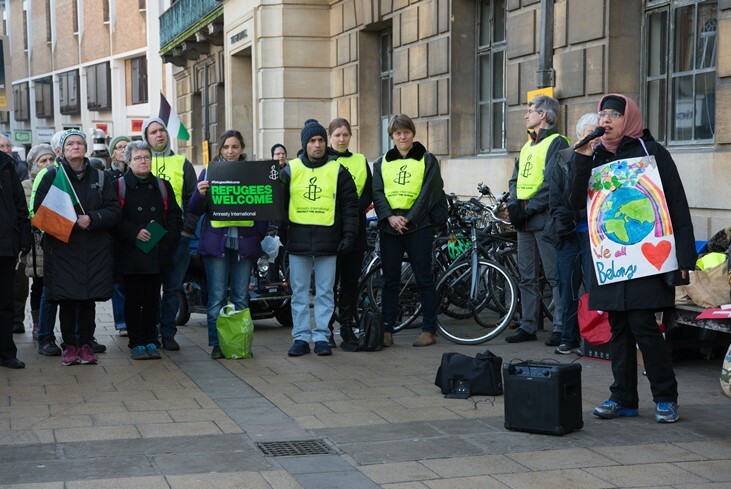 On 20 October, a group of people gathered in Cambridge to think about ways to challenge the Government’s ‘hostile environment’ for migrants and refugees. They had some ideas. On 24 November, they’ll be meeting again to look at ways to take those ideas forward. 13:00-15:45, Mill Road Baptist Church Hall. Book at http://bit.ly/2zBOgLR . See you there! 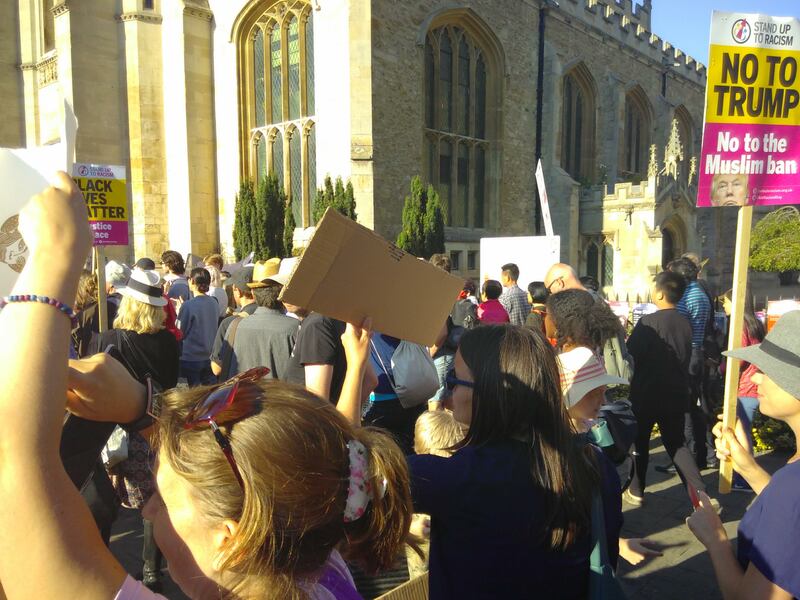 Here are pictures from the Cambridge demo against Donald Trump’s visit, on the evening of Thursday 12 July. 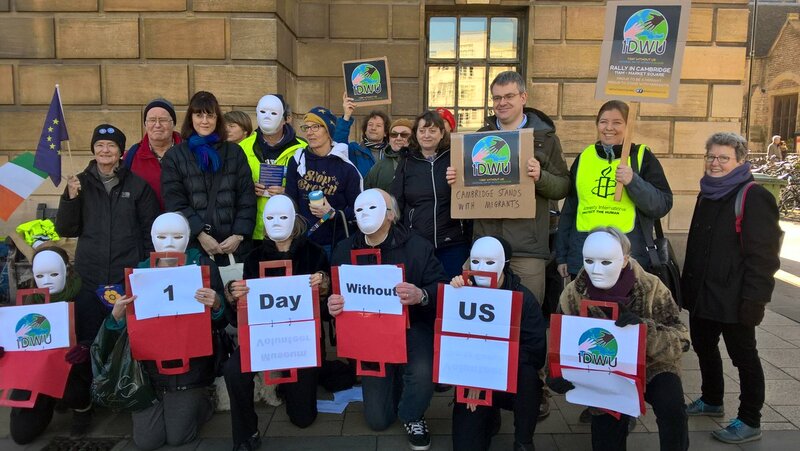 Spot the veteran Global Justice Cambridge activists involved, albeit in different hats. 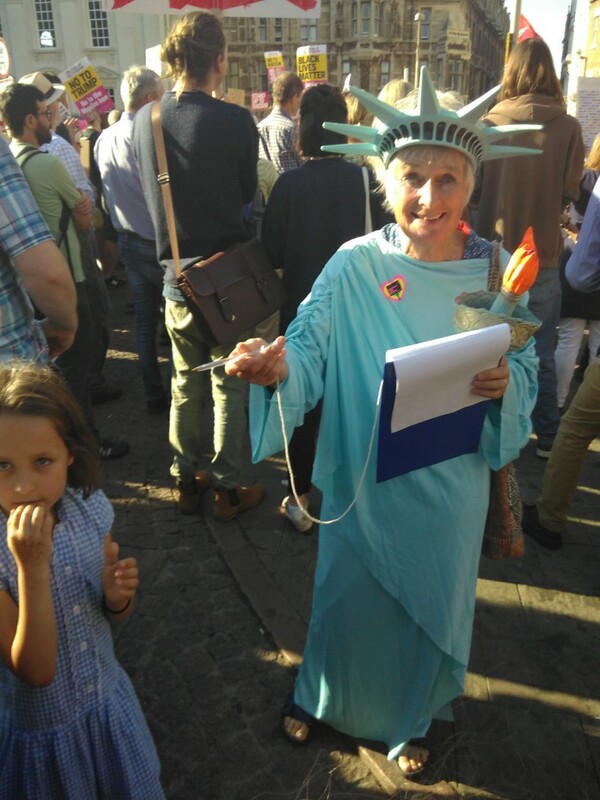 Longstanding group friend Sue Woodsford is the Statute of Liberty, collecting signatures for an Amnesty petition. Preparation continues for a public meeting exploring the impact of the ‘hostile environment’ for migrants and refugees. The 20 June planning meeting was chaired by Akram Salhab of Migrants Organise and brought together people from a good few other organisations. It fixed the date of the public meeting as Saturday 20 October, provisionally 12:30-16:00. Watch this space for more details. 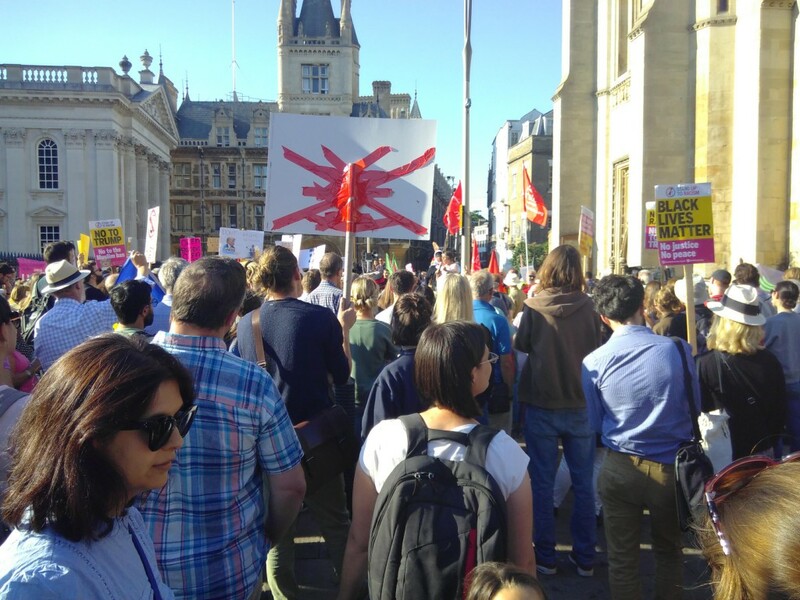 Global Justice Now, along with us of the Cambridge group and some other bodies, is planning a public meeting for Cambridge in early autumn to explore how we can best counteract the Government’s ‘hostile environment’ for migrants and refugees. There’ll be a planning meeting for this event at 18:00 on Wednesday 20 June. Numbers for this planning meeting are unfortunately very limited. If you’d like to be part of it, email globaljusticecambridge [at] gmail.com . We will let you know as soon as we have a date for the public meeting so you can put it in your diaries. Cambridge activists are to screen a documentary showing how governments and pharmaceutical companies in the West blocked access to low-cost AIDS drugs for countries in Africa and the global South – and how AIDS activists, practitioners and patients in the South fought back to get the blocking overturned. Fire in the blood, by Daniel Mohan Gray, will be shown in the Old School Hall at St Barnabas’ church, Mill Road, at 19:45 on Friday 27 April. Tickets are obtainable from http://bit.ly/2EkQ1xj . Admission will be free, but donations invited. Fire in the blood is a film everyone should see. 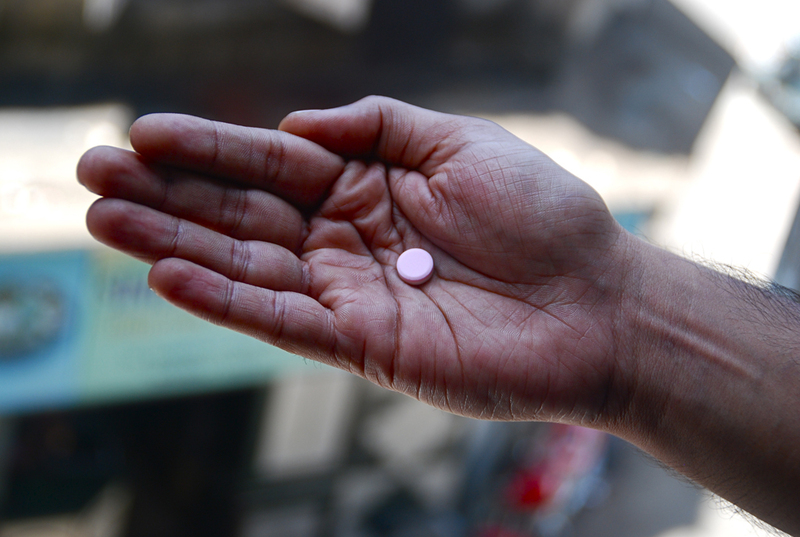 The battle for low-cost access to AIDS medication isn’t over. 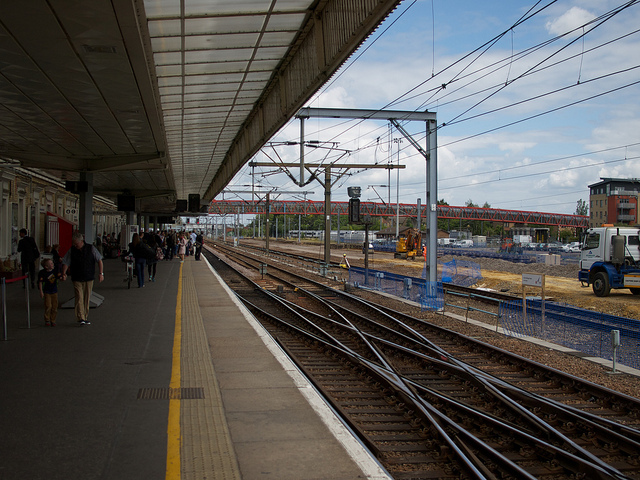 Fire in the blood shows what progress there’s been, and what’s still holding it back. More information about Fire in the blood, including links to reviews, is at http://fireintheblood.com/ . Global Justice Cambridge joined migrants and friends for a rally outside the Guildhall at 11:00 am on Saturday 17 February — part of a national day of action, with more than fifty events happening nationwide, to celebrate the huge contribution made by people from all over the world to life in the UK. The central message was “Proud to be a migrant / proud to stand with migrants”. The day was co-ordinated by One Day Without Us. Speakers included Marcus Johnson of N.W. Brown, Zareen Taj of Stand Up To Racism, Dan Ellis of Cambridge Refugee Resettlement Campaign, Aidan Baker of Global Justice Cambridge, Liesbeth ten Ham of Amnesty International Cambridge City Group, Paul Browne of Cambridge Stays, Mitch Mitchell of Refugee Lifeboat, and Prof. Catherine Rowett of the University of East Anglia. And organiser Karol Florek made a video of the stunt as it happened, complete with soundtrack by Keller Williams. Global Justice Cambridge meets on the third Wednesday of every month. For details and venues, contact Branch Secretaries Aidan and Clare Baker: email globaljusticecambridge [at] gmail.com or ring 01223 510392.